After the CBS takeover of Fender in the mid-1960's, the following 1970's decade brought about many changes. The guitar market was booming and most U.S. musical instrument manufactures attempted to produce their instruments faster and for less money. The Fender instruments suffered a gradual sloppiness associated with the fit and finishes and a subsequent "body bloat" that their instruments experienced up to and including 1981. Simultaneously, Fender's own off-shore manufactured instruments were finding their way on to U.S. shores. These Asian made Fenders were quite nice looking and more refined, it is likely that this too was a contributing factor which spawned the motivation to improve quality and regain lost market share. The hiring of Dan Smith away from Yamaha during this period played an important role in the redevelopment process and successes that ensued. When 1982 arrived, big changes were underway at Fender and this Elite series bass is evidence of that. It was during this period that Fender began making some very nice looking and feeling instruments again. The decision to rethink and innovate, as well as put the entire Fender product line on a belated and much needed body-shape diet was very helpful. The revisions brought about the higher quality and innovative 1983 "Elite Series" instruments as well as the Vintage Reissue Series instruments that had been introduced sometime in 1982, the latter may have been what single-handedly saved Fender. The Vintage Reissue Series instruments drove sales, and the public's interest in them still remains strong all these years later! I have examined, tested, serviced and set-up this instrument and found it to be factory-correct and unmolested in every way. All of the electronics, frets, nut, tuners, finish and both the plastic and gold-plated metal hardware are correct and original to the bass. Globally, the bass has very little signs of usage. It displays some very minor and small marks and I see 2 very small dents on the back of the neck, but there are no major cosmetic or structural issues to notate. The gold-plated hardware is very clean and shows only slight signs of human contact or fading. The bass appears to have only been played at home and not gigged with, it's clean, shiny and beautiful! The protective plastic is still on the battery cover back plate. If You want to read more about the special features, please refer to the 1983 Catalog photographs that I've included. 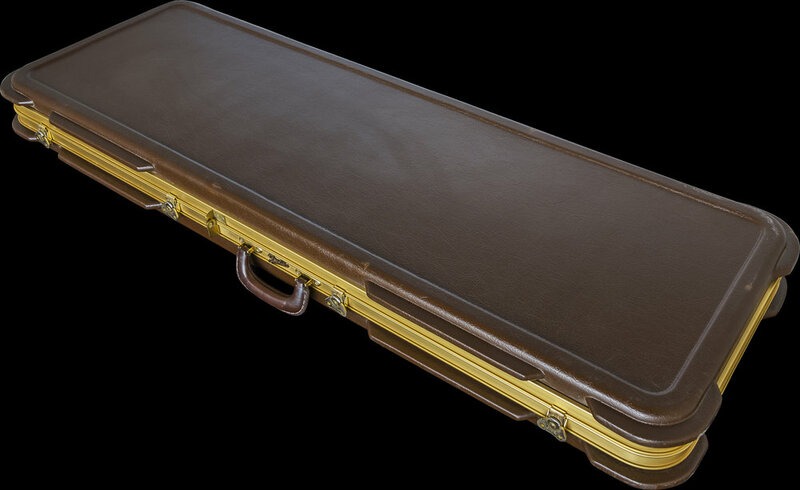 The Case is Original to the Bass. All of the GOLD ELITE series instruments included one of the rugged ATA approved "Voyagair" cases, which were intended to be road-ready if needed. They feature extreme strength, special interior padding, and a moisture-proof gasket. There is also a special hasp just in case you want to install your own padlock. The STRINGS are original to the bass, it has remarkably retained it's FACTORY-INSTALLED set of Fender round wounds that still feel and sound good to me when I played and tested them, the bass is a TIME CAPSULE example! This bass is 35 years old now. I originally purchased it about 25 years ago. There was a time in the late 1980's and early 1990's that I began acquiring some of the Elite Series Fender guitars and basses as inventory for my retail store. Once I discovered them in the used markets, I began liking some of the unusual and interesting Custom Colors and 2 tone, Top to Bottom color-fades named "Stratoburst" finishes that some of the Elite Series instruments were done in. These were a unique and innovative sign of the times and further proof that Fender was really trying to make a statement and get their products noticed again. 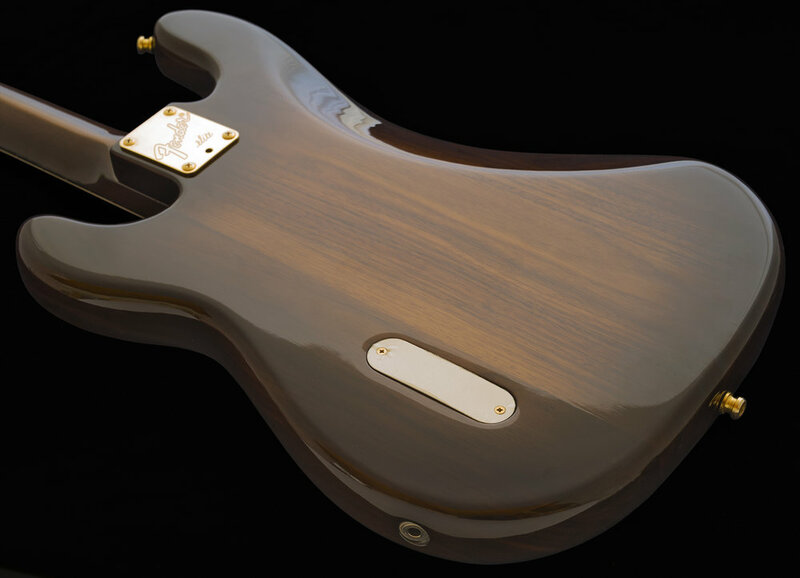 The "Walnut Elite II" Bass model features a solid Walnut Body and matching Walnut Neck, and this was the ONLY Elite Bass model to receive an Ebony fingerboard. This was the most expensive and consequently, 1 of the least produced versions of the Elite Bass Series, making it one of the rarest, which was the reason I decided to add this particular example to my collection and have never offered it for sale, until now. COLLECTORS may also be interested to know that this Walnut Elite II bass was featured in my Fender Bass Book on Page 78. If you've ever wanted a Rare, Collectible and unique Fender Bass, this is a special opportunity. This particular bass is an exceptional, well-preserved, uncirculated, documented and published specimen. If an example of this caliber appeals to you, kindly inquire about it.